Fried bananas on bamboo skewers, also known as banana cue among Filipinos, is a popular snack food in Philippines. It’s widely sold on the streets in food carts or in small stationary food stalls. When I was in high school, my family had a small food stall just across the national high school in our town, and banana cues were one of my Mama’s best-selling snack foods for sale. The term banana cue is actually confusing to a lot of people. Although one might think it’s similar to a barbecue where slices of marinated meat are placed on bamboo skewers and grilled over hot charcoals, but it’s not. 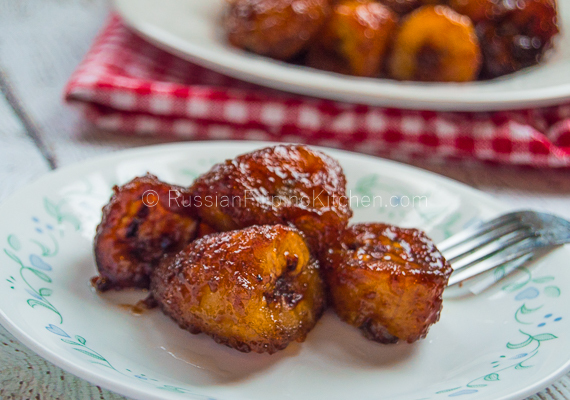 Banana cue is simply deep fried ripe saba bananas coated with caramelized brown sugar while it’s cooking. It’s not marinated and skewered as it’s being cooked, and definitely not grilled over hot charcoals. The fried bananas are only placed on bamboo skewers afterwards for ease of eating. Since they look similar to barbecued meat just by being on a stick and also due to its caramel color when done, it got its name “banana cue”. I often make this well-loved Filipino snack food since I came to the US. Partly to satisfy my sugar cravings, and partly to ease my homesickness. Every time I make this, I feel my mom closer to me. When I was still living with my parents, I watched her fry hundreds and hundreds of banana cues over the years and sold them for less than 5 pesos a stick. It was humbling and amazing to experience, and I’m always grateful that with my parents’ hard work and sacrifice running that mini food stall, they were able to pay for some extra expenses while my older sister and I were in college. Anyway, back to the recipe, this is so easy to make and delicious. Just a quick note: you have to use saba bananas (cardaba) because using other varieties won’t yield the same result (based on my experience). 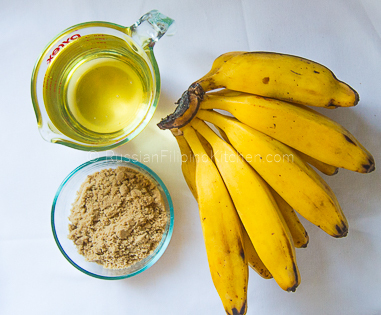 Most people prefer to eat banana cues from sabas that are “just riped” which means they are firmer, absorbs less oil, less sweet, and doesn’t turn soggy several hours later. I prefer mine to be much riper, juicier, and sweeter with extra coating of caramel. As I’ve mentioned above, banana cues are usually placed on a stick and the bananas are fried whole, but since we just eat it at home, I cut it up into smaller pieces prior to frying to make it easier for my children to eat, and also skipped the bamboo skewers and just serve it on small plates with fork. 1. 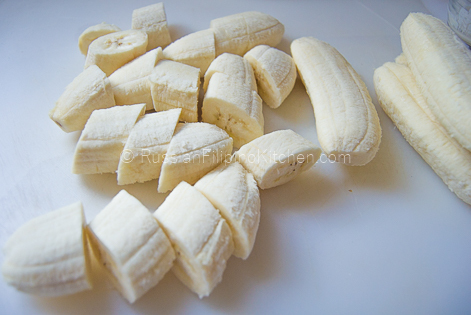 Peel bananas and slice into 1 inch thick. Set aside. 2. Place frying pan on a stove and turn settings to medium. Pour in the oil into the pan. 3. Add ½ cup brown sugar after two minutes and wait until it starts to melt and caramelize. Turn down heat a little so you don’t burn the sugar. You’ll know you’re ready to fry when you see the melted sugar floats to the top. 4. 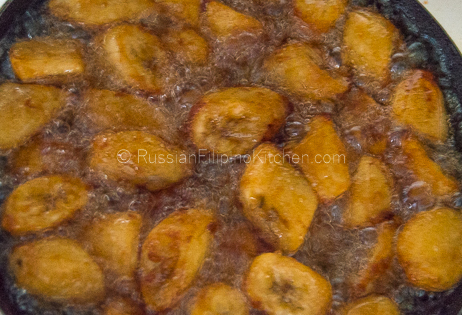 Add banana slices or whole bananas (if you prefer them that way) carefully into the hot oil and deep fry. 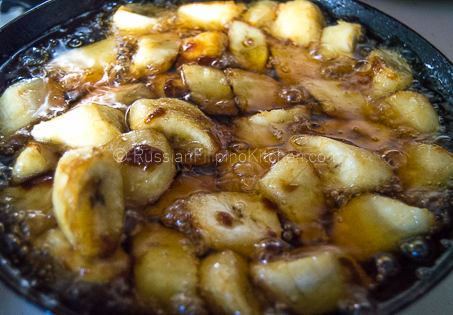 Use a cooking spoon or spatula to move them gently around the pan several times to coat the bananas with the caramelized sugar. Use the remaining sugar to sprinkle patches on the bananas that aren’t covered with the caramel. The sugar will melt and turns into caramel as well. Continue frying until they’re golden brown. 5. Remove from pan and transfer to a plate. Allow to cool before serving. • You can add or reduce the amount of sugar in the recipe according to desired sweetness. 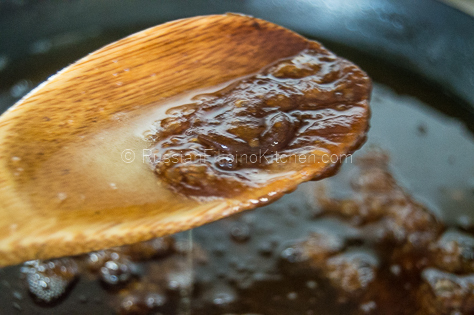 • Use brown sugar to make the caramel. White sugar doesn’t give that deep golden color on the bananas after they’re cooked. Peel bananas and slice into 1 inch thick. Set aside. Place frying pan on a stove and turn settings to medium. Pour in the oil into the pan. Add ½ cup brown sugar after two minutes and wait until it starts to melt and caramelize. Turn down heat a little so you don’t burn the sugar. You’ll know you’re ready to fry when you see the melted sugar floats to the top. Add banana slices or whole bananas (if you prefer them that way) carefully into the hot oil and deep fry. 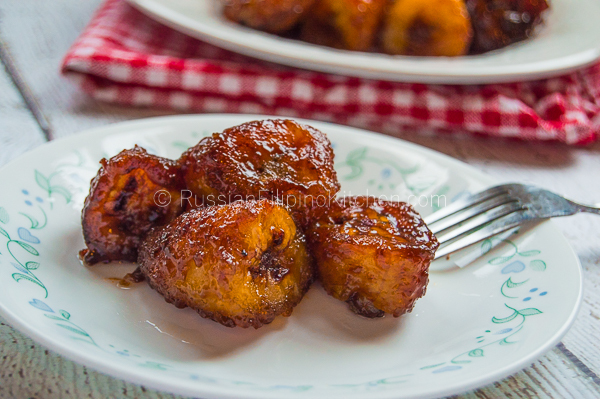 Use a cooking spoon or spatula to move them gently around the pan several times to coat the bananas with the caramelized sugar. Use the remaining sugar to sprinkle patches on the bananas that aren’t covered with the caramel. The sugar will melt and turns into caramel as well. Continue frying until they’re golden brown. Remove from pan and transfer to a plate. Allow to cool before serving.